Previously sold in these Rooms, 1 October 1991, lot 836, and again at Sotheby's Hong Kong, 28 April 1998, lot 783. 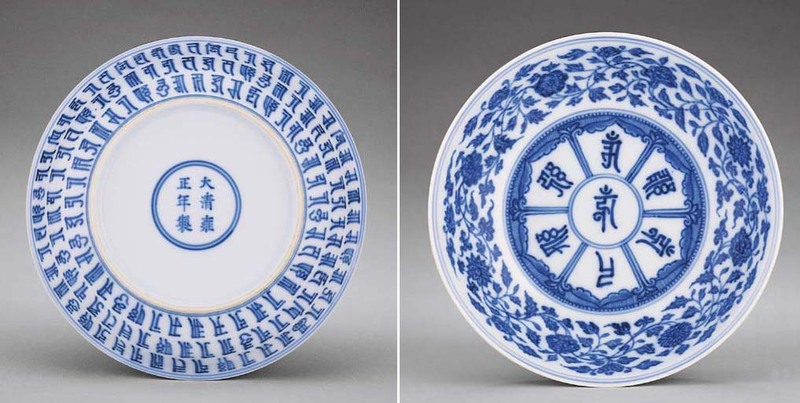 This dish belongs to a group of 18th-century blue and white porcelains painted with lanca characters, which reflects the court's interest in Lamaist Buddhism. The religion flourished during the Qianlong reign, with numerous temples dedicated to the faith built within the Palace and with a proliferation of ceramic wares decorated in this style. For the inspiration of this design, see the Chenghua-marked dish of nearly identical design with the same central medallion and two registers of lanca characters around the exterior, from the National Palace Museum, Taiwan, included in the Special Exhibition of Ch'eng-hua Porcelain Ware, 2003, illustrated in the Catalogue, no. 74. Cf. the Wanli version of this dish also from the National Palace Museum, illustrated in Minji Meihin Zuroku, vol. III, 1978, pl. 89.